There’s putting fashion before comfort, and then there’s choosing freebies over fashion. In aid of Wear Your Pyjamas To Work Day (where do we sign up? ), Barasti is offering a complimentary beverage to anyone dressed in their sleepwear on Tuesday April 16. 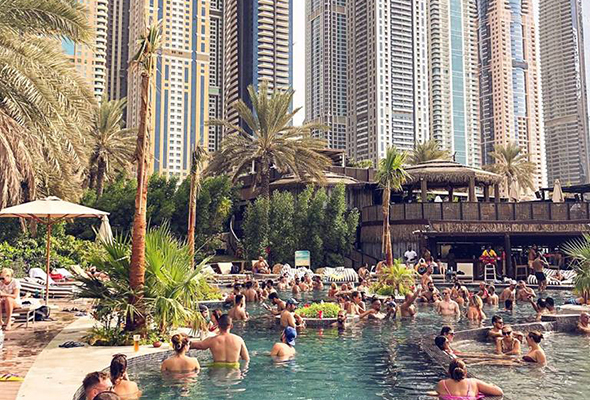 Forget everything you know about getting ready for a day (or night) at the famous Dubai beach bar, now you can simply roll out of bed and be rewarded for it. Whether its a fluffy onesie, matching patterned set or your unicorn slippers, there’s no judgement held on this occasion. Wear Your Pyjamas To Work Day began in the US and is held annually the day after their taxes are due. It’s a time when you can kick back and relax knowing the worst is behind you. It’s not an occasion widely-celebrated in the UAE, but Barasti Beach is hoping to change that. By offering all cosy-clad customers a complimentary beverage, they’re bringing the peculiar celebration to Dubai. Barasti recently renovated its beach bar and now serves up breakfast from 10am, so if you feel like tucking into French toast in the comfort of your pyjamas then this sounds like the event for you. Dare to rock the I really did wake up like this look in public, and you’ll soon be sipping on a refreshing beverage on the shores of Dubai.